I admit it. I used to complain about the radio stations that started playing Christmas music the day after Halloween. Or the people who decorated their house for Christmas before it was even Thanksgiving. But then, I got older and busier. And, one Sunday afternoon in November, I found myself being sucked into the vortex that is Hallmark Channel’s “Countdown to Christmas”. Suddenly, I had become what I once made fun of: a person who starts celebrating Christmas in November. It’s not that I don’t appreciate Thanksgiving or Fall. Or that I decorate my home from top to bottom with fake snow and 82 collectible Department 56 houses on November 1. No, I simply sit down sometimes in November and watch cheesy Hallmark Christmas movies for a couple hours. Christmas movies are on TV. I have time in November to watch Christmas movies. They’re sweet and feel good type movies. The weather outside in November is pretty much the same as the weather outside in December. Watching Christmas movies in November gets me in the Christmas spirit. There aren’t two family birthdays to celebrate in November, nor presents to buy, wrap, and ship in November, nor Christmas dinners to plan in November, or class parties to attend or buy things for, or cards to write and send. So, pull up a chair and join me for a relaxing 2-hour-long Hallmark Christmas movie. I promise, you won’t have to think too hard. Plus, there’s always a happy ending. Before you know it, you’ll get sucked into the vortex of watching Christmas movies in November, too. I love Christmas movies. Last year I discovered Arthur Christmas and loved it so much we continued watching it into January. In the UK we have bonfire night on the 5th November and then thats it until Christmas. With nothing else going on I don’t mind starting them now. In fact I might put one on today! Ooo, enjoy if you get time to watch one today! Yes, but do you have time in November to watch Christmas movies? Thanks for visiting! Glad I could lift your spirits and share some Christmas spirit, too. Exactly! Those movies just make you feel good — and don’t require too much thought. It’s like a mini-vacation. LOL at you blasting the Christmas music in the car! The Rambler recently posted…Open Letter to Old Jolly Saint Nick. Having time now vs. December is probably the only reason I do it! Well, I guess it’s 5 out of my 10 reasons, LOL. So that makes me extremely curious who is watching those in say, April?! I guess enough people are. I should be quiet. It’ll probably be ME in my retirement. Glad to know that I’m not the only person who enjoys all the Hallmark Christmas movies. There, I ‘said’ it out loud. The stories are sweet, there’s always a happy ending after a bump in the road (often unlike the real world), and they are on late at night when I cannot sleep. They really are sweet, aren’t they? And easy to watch. You don’t have to think too hard and after managing my family’s schedule, homework, drs appts., etc. that’s exactly what I need! Yup! December is just too crazy with trying to get the gifts done, decorations, etc. You know what? If it puts us in a good mood, then I think our husbands should be happy about that! Enjoy your Christmas music and movies. I’m *this close* to starting to listen to Christmas music. 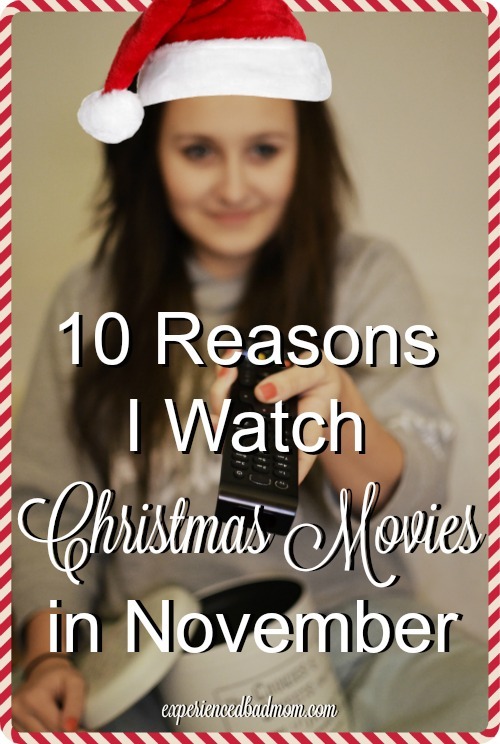 I would love to have time in November to watch christmas movies! But I don’t because I’m busy testing and making Christmas recipes. So….I guess you could say it’s the same. Enjoy your movie watching! Ha! That’s great. I didn’t realize where I was b/c I thought the pic of the girl with the remote control was you. I always get so confused with that. And I’ve had friends say the same thing to me. “You wrote that?? But the photo didn’t look like you..” Sigh. It’s just a photo. We are so easily fooled….Such a tangent. I enjoyed this idea. I hear Candace Cameron Bure has a new one this year. April recently posted…Do your kids love writing thank you notes?? ?…..So here’s a solution. I put up my Swedish Christmas birds in the kitchen in September. Do not tel!